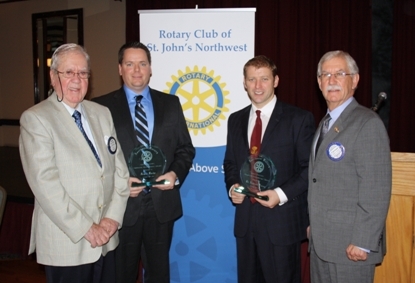 In 2010, the Northwest Rotary Aidan Maloney Young Professionals Award was created to recognize up to two young professionals annually who have positively impacted their chosen vocations and communities. 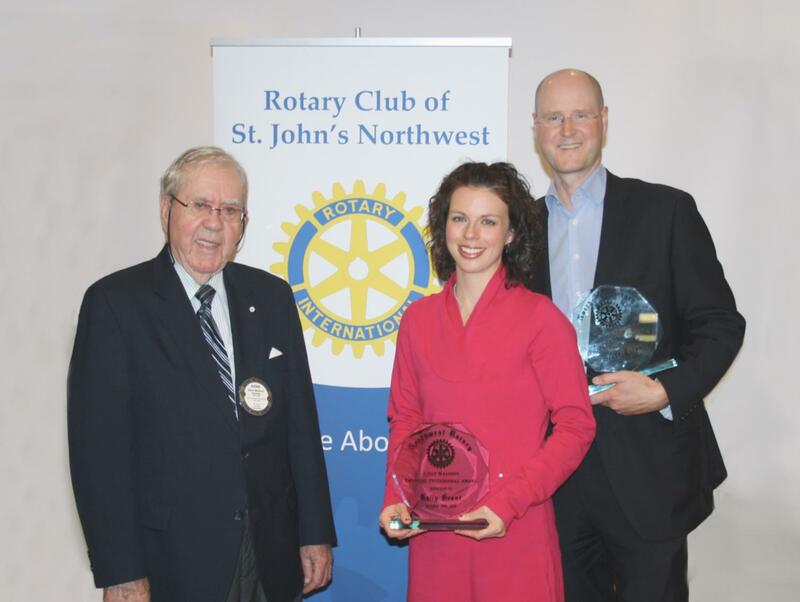 This award demonstrates Rotary’s commitment towards developing young professionals and profiles the work of Rotary, while proudly honoring a St. John’s Northwest Rotarian, former Rotary District Governor Aidan Maloney. Susan Collins is Vice-President, Business Development of PF Collins International Trade Solutions, a leading Canadian provider of integrated international trade and project logistics services. Established in 1921, PF Collins is a fourth-generation family business with branches in St. John’s, Halifax, Moncton, and Calgary. In her over 15 years of experience, Susan has become a specialist in project transportation, out-of-gauge cargoes, and overall logistics for the energy and offshore industries. After graduation from Memorial University with a Bachelor of Commerce, Susan held positions in materials management, project logistics, and corporate tax affairs with Trident Exploration and Pentagon Freight Services in Calgary before returning to Newfoundland to work for PF Collins. 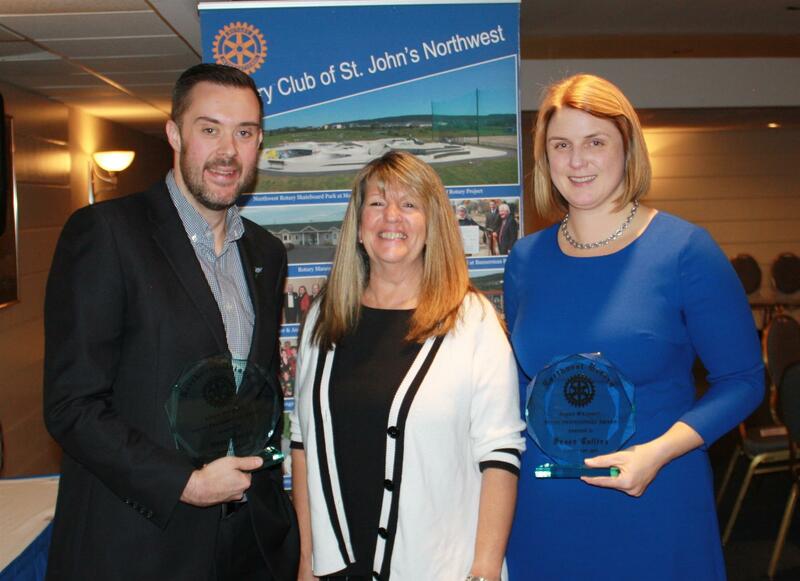 An active community volunteer, Susan currently sits on a number of Boards, including the Royal St. John’s Regatta Committee, Special Olympics Newfoundland and Labrador, and the Dr. H. Bliss Murphy Cancer Care Foundation. Greg has worked in radio for over 13 years and is currently the host of VOCM's Irish Newfoundland Show and Early Evenings. Greg's professional career has a strong focus on the local community, from its vibrant music scene to its many non-profit organizations. This focus has carried into Greg's personal life where he is an active volunteer throughout the community. He currently serves as a member of the Board of Dodgers for Easter Seals' co-ed Dodgeball League (Dodge Dive Donate), which has raised $23,000 since forming in February 2016 and has also recently helped in the planning and organizing of the Kidney Foundation's annual walk. He has also served on the board of the Newfoundland and Labrador Folk Arts Society, chairing the NL Folk Festival Programming Committee. Greg is passionate about his community and continues to lend his name and voice to many initiatives and charitable causes. 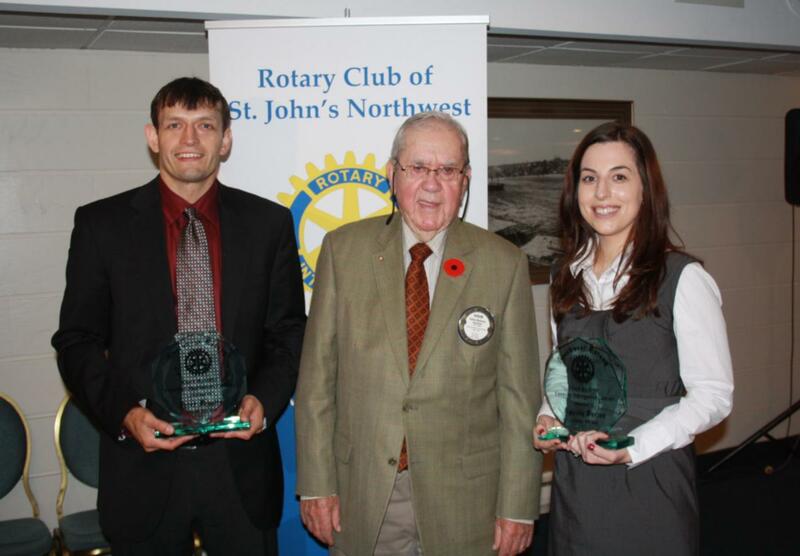 Aidan Maloney has been a member of the Rotary Club of St. John’s Northwest since 1970 and has served as Club President (1979-1980), District Governor (1987-1988) and is a Paul Harris fellow (1988). Over his lifetime, he has positively impacted the Newfoundland and Labrador community at an exemplary level within and beyond the Rotary family. Mr. Maloney is a member of the Order of Canada, holds an honorary doctorate from Memorial University of Newfoundland and Labrador (MUN); is a recipient of the Lieutenant Governor’s Newfoundland and Labrador Volunteer Award and the Red Cross Humanitarian of the Year Award; is a former Provincial Minister for the Department of Fisheries; and was Honorary Counsel to Japan. He has been involved in numerous boards and volunteer organizations over the years, including former Chairman of the Board for St. Clare’s Hospital, and board member for the Newfoundland Quarterly Foundation and Railway Coastal Museum. In addition, he has personally funded scholarships focusing on musical excellence and enjoys singing in the Mary Queen of Peace Church Choir. Above all, Mr. Maloney has accomplished this life of community service with grace, humility and cooperation; setting a solid example for young professionals. 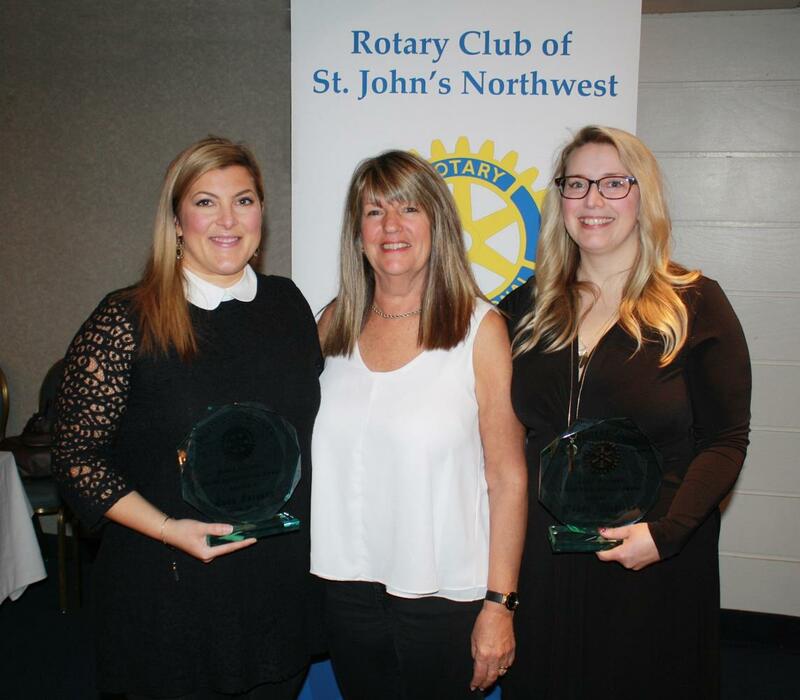 Click here to watch a video of past recipients describing how the impact of receiving an award named after Aidan Maloney has motivated them to do even more in their community. Click here to watch a video of past recipients and learn what receiving this award has meant to them. 2010 Presentation: (L-R) John Andrews, Vocational Service Director; Andrea Stack, Club President; Holly White, award recipient; Aidan Maloney, Past District Governor; Raelene Lee, award recipient; Sandi Patterson, Chair of Vocational Service Award.